Go to MissionHouses.org for more information. 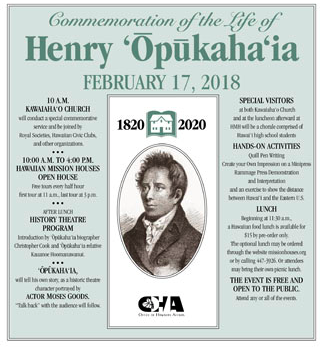 On February 17, 2018, Hawaiian Mission Houses Historic Site and Archives will celebrate the life of Henry ‘Opukaha‘ia marking the day he died two hundred years ago. This important celebration honors the man who inspired the Sandwich Island Mission and is the first event in the bicentennial of the arrival of the American Protestant mission to Hawai‘i in 2020. From 10:00 a.m. to 4:00 p.m. on Saturday, February 17, 2018, the houses and grounds of Hawaiian Mission Houses will be open to the public free of charge. As with our 2 other open houses, historic house tours will be conducted every half-hour, with the first tour at 11 a.m. and the last tour at 3 p.m. The printing press will be continuously operated and interpreted with either the “Ho‘onani,” (Doxology) or the Hawaiian Primer, the first print struck in Hawai‘i, being printed all day for participants to take home. Activities on site will include some of those used in the HMH school program. For example one will emphasize the distance between Hawai‘i and the Eastern U.S. Another will offer the opportunity to create one’s own work on an individual mini printing press, and another will allow users to experience writing with a quill pen while copying a letter from one of the ali‘i from the HMH archives. At 10 a.m. historic Kawaiaha‘o Church will conduct a special commemorative service and be joined by Royal Societies, Hawaiian Civic Clubs, and other organizations. Concurrent church services in Hilo and on the East Coast will also celebrate the life of ‘Opukaha‘ia and those who attend will learn about his role in inspiring the American Board of Commissioners for Foreign Missions (ABCFM) to send missionaries to Hawai‘i to bring Christianity. Audience may or may not choose to attend this service.